Metal Zippers are not as straight forward as you might think. Metal zippers are not equal. You will notice several price points below. The less expensive zippers are not as refined, the teeth are still strong but not as finished as the more expensive zippers. I found this amazing zipper manufacturer in Japan that first buff & polish each tooth before applying it to the tape, then electroplate the teeth to make a very smooth running metal zipper. Because of the extra care used to prep the metal, these are my favorites for use in handbags. They can be ordered in specific lengths, in your custom colors in small quantities with a turn around time of about 2-3 weeks (depends on what part of the year). Metal zipper yardage is below. 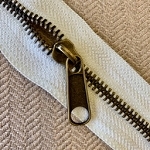 If you need SEPARATING or jacket style zippers, there is a category specifically for those metal SEPARATING zippers. I stock #5 or 5mm metal yardage but have ordered #8 & #10 for delivery late in February or early March. Using beeswax on the teeth helps it slide easier and will keep the zipper working longer. Most metal zippers are asymmetrical so the zipper head needs to be put on the tape more specifically than a coil or molded tooth zipper.